This month for my Io Volcano of the Week series, we are looking at volcanoes that were observed at moderate resolution (160-280 meters or 525-920 feet per pixel) during Galileo's I25 flyby of Io on November 26, 1999. Over the last three weeks we have looked at Zal, Emakong, and Hi'iaka, three large paterae - volcanic depressions - on Io's leading hemisphere. This week we take a look at Culann Patera. Like Emakong, the green-colored patera is surrounded by a number of distinct lava flows of varying surface colors and ages. The most recent of these flow lobes formed between 1979 and 1996, along with a number of other changes at Culann between how it appeared during the Voyager flybys and the Galileo mission. Unlike Emakong, lava temperatures measured at Culann by the Galileo spacecraft are clearly in the silicate range, suggesting that the colored lava flows are a surface coating after they had cooled, rather than the result of sulfur volcanism. It is also the site of a faint, dust-poor plume, observed by Galileo in 1998, though a fairly distinctive plume deposit was seen by the spacecraft. Culann Patera was first observed in Voyager 1 images. It is located 600 kilometers (375 miles) south-southwest of the active volcano Prometheus at 20.2° South, 160.2° West. The spacecraft observed dark lava flows surrounding the small patera (not seen by Voyager due to the low resolution) with a narrow flow lobe extending out to the northwest of the main flow field before turning west. The darkest of the flows seen by the Voyagers was to the southwest of the patera that was later seen by Galileo. The volcano was named by the IAU in 1979 after a blacksmith from the Ulster cycle of Irish mythology. Culann was next observed by Galileo 17 years later. Its first images of the region were taken in September 1996, revealing a number of changes as a result of volcanic activity in years between observations including fresh silicate lava flows and a reddish plume deposit. Many of the flows that were dark in 1979, suggesting they were active at the time, had brightened by September 1996, meaning they had cooled enough to permit sulfur and sulfur dioxide to condense on them. NIMS detected a thermal hotspot at Culann during this encounter and through 75% of the observations of this region during the nominal mission, showing that the volcano remained active throughout the Galileo mission. 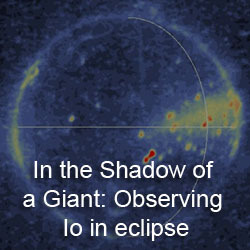 A small, faint plume may have been detected in September 1996 (which could have been the source of the new reddish deposits at Culann), along with a gas plume seen while Io was in Jupiter's shadow in May 1998. 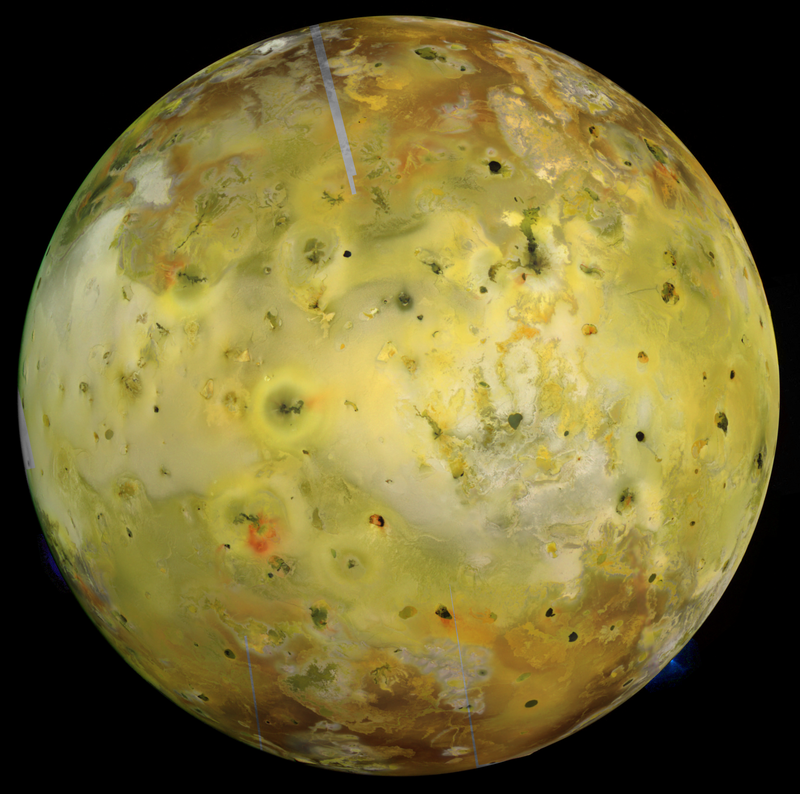 Details on the style of volcanic activity at Culann would come during Galileo's flybys of Io in late 1999 and 2001. Lower resolution color data from throughout the Galileo mission showed that Culann Patera was host to a variety of colored terrains, with green, red, and yellow colored lava flows and plains in close proximity. 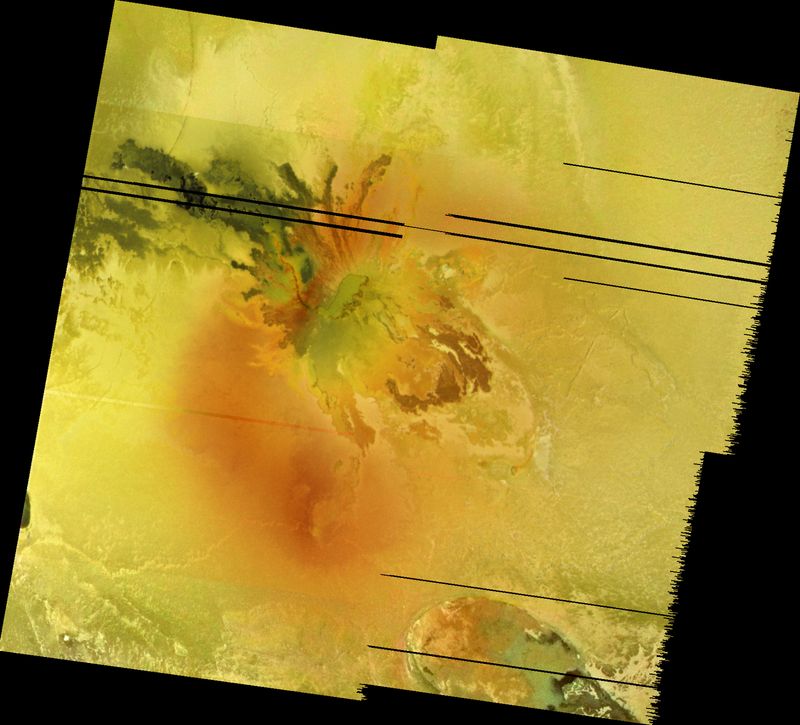 As a result, the imaging team targeted the volcano for a medium resolution, two-by-two frame, color mosaic during Galileo I25 encounter on November 26, 1999. I've processed the images that were returned into the three mosaics below. All three use orthographic projection with a scale of 206.3 meters (676.8 feet) per pixel. The first is a mosaic of the red, green, and violet frames returned from the 25ISCULANN01 observation [high-resolution version available]. Only those areas covered by all three colors are included. The second mosaic covers the same area as the first, but the blue channel uses a synthetic blue filter image created using the method I described last week [high-resolution version available]. The third mosaic includes the area from the first mosaic, but includes the rest of the green filter data from the 25ISCULANN01 observation [high-resolution version available]. This additional data was colorized using data acquired in July 1999. These images revealed that Culann Patera was a shallow, green floored depression, seven kilometers (4.3 miles) by 23 kilometers (14.3 miles) in size. Both the patera and the region surrounding it (particularly to the south and east) are coated with green material, and this greenish terrain is in turn surrounded by a 150- to-170-kilometer-diameter (93 to 106 mile) ring of red deposits (that was a bit more distinctive to the east of Culann Patera earlier in the Galileo mission). Many of these deposits coat an overlapping set of lava flows that radiate out from the patera. A curved, dark red line runs for 42 kilometers (26 miles) from the southwest end of the patera toward the northwest, growing fainter the farther northwest it goes. It terminates in the proximal end of Culann's darkest and youngest lava flow fields, which run another 75 kilometers (47 miles) to the north west. Multi-colored, older lava flows are seen to the southeast of Culann Patera. These correspond to the darkest flows seen by the Voyager spacecraft in 1979. These lava had flowed into a shallow depression that is surrounded by low, etched mesas. 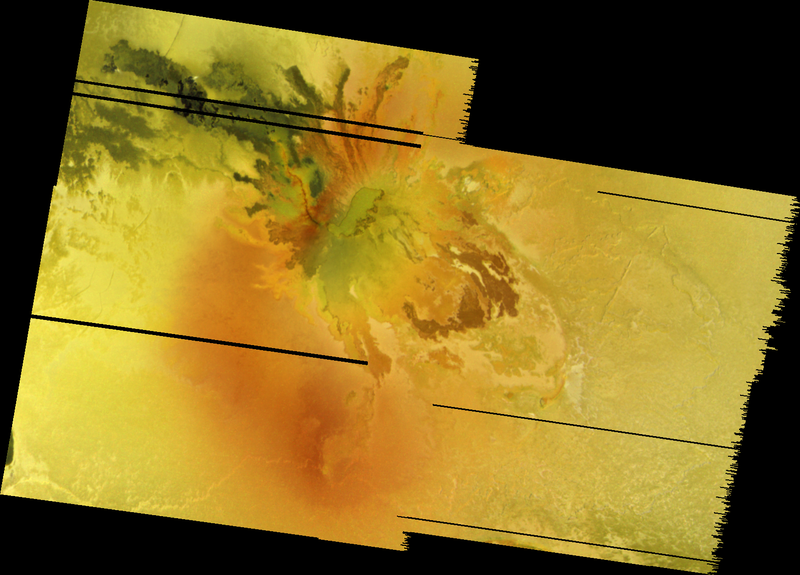 Comparing these images to a regional mapping observation taken in October 2001 reveal a number of changes within this dark flow field, suggesting that like Prometheus, it is a compound flow field that is built up by fresh, darker breakouts of lava. One suggestion provided by Keszthelyi et al. 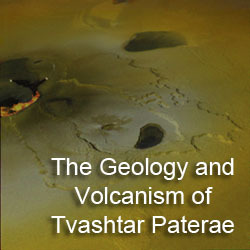 2001 is that the curved, red line seen running northwest of the patera is a lava tube that brings lava from the source at the patera to the flow field. The reddish material that marks the location of this lava tube may result from sulfurous gases escape through skylights on the roof of the lava tube that then condense on the colder plains nearby. Lava flows through this lava tube from its source at Culann Patera to the lava flow field, where it spills out into first small breakouts in the medial portion of the dark flow field, then larger areas of warm, dark lava toward the distal end of the field. This idea is supported by high resolution near-infrared spectrometer data, which revealed two hot spots within the Culann volcanic system. The brightest hotspot is located over the dark flow field due its large exposures of recent lava. A smaller thermal hotspot is located at Culann Patera, the source of the lava flows in this region. The long length of the flows radiating out from it suggest that the lavas they are composed of had a very low viscosity, as there is very little difference in altitude between the margins of Culann Patera and the surrounding plains, based on stereo images by Galileo. The colors seen at Culann are thought to be result of the interaction between sulfur and silicate lava. When sulfur, emitted from the source vent at the patera or from the main active lava tube, condenses and lands on the surface, it normally creates a reddish deposit on the surface. The size of the deposit is the result of the temperature of the escaping gases and the vent pressure. Given the size of the red deposit at Culann, both factors are likely to be less than at Pele, which has a red ring plume deposit more than a 1,000 kilometers (600 miles) across. When this sulfur condenses on Io's cold plains (~120 K/-244° F), this produces a red deposit. When it lands on warm lava, the sulfur is thought to interact chemically with the iron in Io's lavas to produce greenish iron sulfide, or pyrite as it is known in its mineral form. A few bright white spots are seen along portions of the current flow field to the northwest of Culann Patera. These result from the interaction between cold sulfur dioxide frost on Io's surface and hot, silicate lava that flows over it. The lava vaporizes the frost, which then condenses on the cold ground outside the flow field, or on older, colder areas of the flow field (gradually brightening the flow as it ages as more SO2 frost and sulfur is deposited on it). 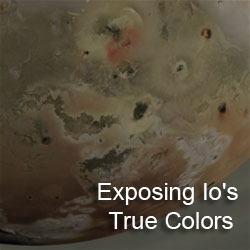 The color observation of Culann Patera in November 1999 allowed researchers to examine the relationship between different color units seen all across Io's surface. They revealed a complex interaction between sulfurous gases, emitted either from the primary vent or from re-volatilization by flowing lavas, and the terrain these gases land on. They also provided further evidence for how large lava flow fields develop, an idea that seems to be back up at other sites like Prometheus and Amirani. Next week, we will take a look at the target of Galileo's 25ISGIANTS01 observation, Tvashtar Paterae. Williams, D.; et al. (2004). "Mapping of the Culann–Tohil region of Io from Galileo imaging data". Icarus 169: 80–97. Geissler, P. E., M.T. McMillan. (2008). 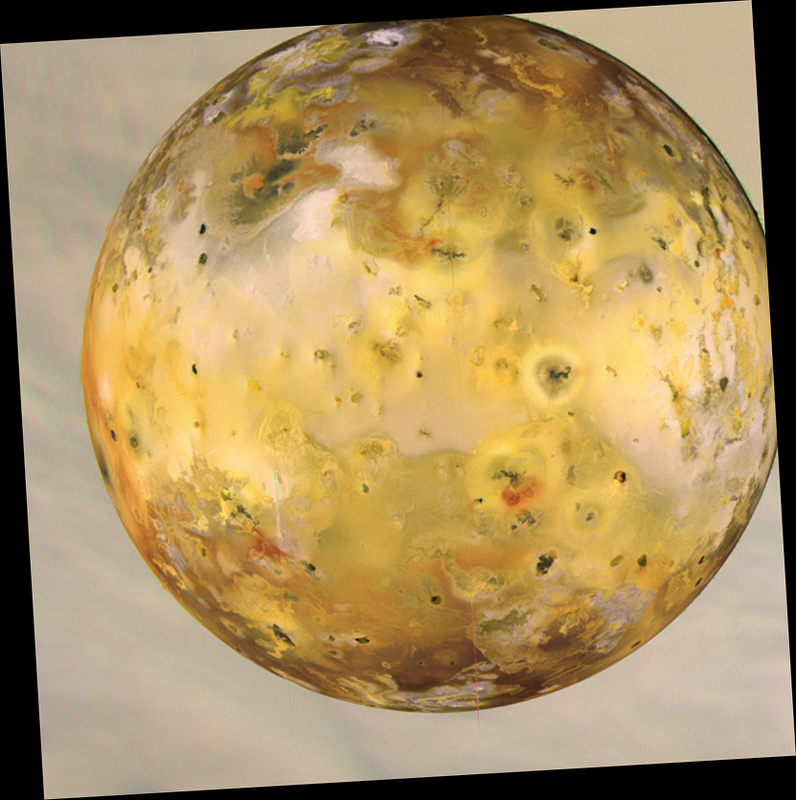 "Galileo observations of volcanic plumes on Io". Icarus 197: 505–518. Lopes-Gautier, R.; et al. (1999). "Active Volcanism on Io: Global Distribution and Variations in Activity". Icarus 140: 243–264. Keszthelyi, L.; et al. (2001). "Imaging of volcanic activity on Jupiter's moon Io by Galileo during the Galileo Europa Mission and the Galileo Millennium Mission". Journal of Geophysical Research 106 (E12): 33,025–33,052. Honey, I Shrunk the Moon!